For the most recent election, see French presidential election, 2017. Currently they are held once in five years (formerly seven). They are always held on Sundays. Since 1965 the president has been elected by direct popular vote. There was one presidential election in France during the government known as the Second Republic (1848—1851). It was held in 1848. The president was elected by direct popular vote. There were 15 presidential elections in France during the government known as the Third Republic (1870—1940). According to the Constitutional Laws of 1875, the President was elected by an absolute majority of votes by the two houses of the Parliament assembled at the National Assembly. There were two presidential elections in France during the republican government known as the Fourth Republic (1946—1958). They were held in 1947 and 1953. The president was elected by the Congress of the French Parliament, a joint meeting of both houses of the French Parliament (the National Assembly and the Senate). There have been 11 presidential elections in France since the establishment of the Fifth Republic in 1958. Originally the president was elected by the Collège des Notables (an assembly of "notable electors") that included around 80,000 county and city/town councillors (who had been elected locally). Following the 1962 de Gaulle's constitutional reform (the Constitutional Act of November 6, 1962) the president has been directly elected by the people of France. Until the French constitutional revision of September 24, 2000, the president had been elected for a seven-year term. Under this revision the term was reduced to five years. Currently, the President of the French Republic is elected to a five-year term in a two-round election under Article 7 of the Constitution: if no candidate secures an absolute majority (including blank and void ballots) of votes in the first round, a second round is held two weeks later between the two candidates who received the most votes. Since 1965, when the current (direct) election system was introduced, every election has gone to a second round. The latest election was in 2017. The first round was held on 23 April 2017, the second on 7 May. ^ Dennis C. Mueller (17 February 2003). Public Choice III. Cambridge University Press. pp. 433–. ISBN 978-0-521-89475-3. ^ "When is the French Presidential Election 2017, how does it work and who are the candidates?". The Telegraph. 2017-04-22. Retrieved 2017-04-22. ^ "France at the Polls: The Presidential Election of 1974". AEI. 2017-07-29. Retrieved 2017-04-23. ^ a b William G. Mayer (2004). The Making of the Presidential Candidates 2004. Rowman & Littlefield. pp. 266–. ISBN 978-0-7425-2919-9. ^ Robert Wistrich (2 September 2003). Terms of Survival: The Jewish World Since 1945. Routledge. pp. 226–. ISBN 978-1-134-85579-7. ^ Philip Thody (31 July 1989). French Caesarism from Napoleon I to Charles de Gaulle. Palgrave Macmillan UK. pp. 105–. ISBN 978-1-349-20089-4. ^ a b Susana Galera (1 January 2010). Judicial Review: A Comparative Analysis Inside the European Legal System. Council of Europe. pp. 71–. ISBN 978-92-871-6723-1. ^ "Constitution du 4 octobre 1958 - Article 7". Légifrance. Retrieved 22 February 2017. ^ "John Oliver Explains Why the French Presidential Election Is More Important Than You Think". Newsweek. 2017-04-17. Retrieved 2017-04-22. 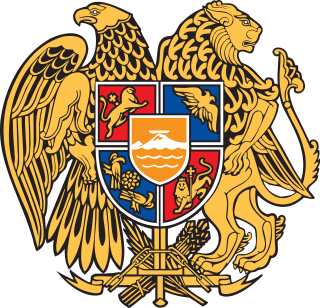 The politics of Armenia take place in the framework of the parliamentary representative democratic republic of Armenia, whereby the President of Armenia is the head of state and the Prime Minister of Armenia the head of government, and of a multi-party system. Executive power is exercised by the President and the Government. Legislative power is vested in both the Government and Parliament. Elections in Benin take place within the framework of a multi-party democracy and a presidential system. Both the President and the National Assembly are directly elected by voters, with elections organised by the Autonomous National Electoral Commission (CENA). Elections in Togo take place within the framework of a presidential system. Both the President and the National Assembly are directly elected by voters. The country is a one party dominant state with the Union for the Republic in power. This national electoral calendar for the year 2017 lists the national/federal direct elections held in 2017 in all sovereign states and their dependent territories. By-elections are excluded, though national referendums are included.